Background Clinical practice guidelines focusing on judicious use of antibiotics for childhood acute otitis media (AOM) have been introduced in many countries around the world. Objective To systematically review the effects of these guidelines on the prescription of antibiotics and analgesics for children with AOM. Methods Systematic searches of PubMed, Embase and Cochrane Library from inception to 6 June 2017 using broad search terms. Studies specifically aimed at evaluating the effects of introduction of national AOM practice guidelines on type of antibiotic and/or analgesic prescriptions were included, irrespective of design, setting or language. The Risk Of Bias In Non-randomized Studies of Interventions tool was used to assess risk of bias. Results Of 411 unique records retrieved, seven studies conducted in six different countries (France, Italy, Spain, Sweden, UK and USA (twice)) compared data before and after guideline introduction. All studies had an observational design, using longitudinal data of children aged under 15 years (n=200–4.6 million) from either routine care, insurance databases or electronic surveys. Risk of bias of all studies was judged serious to critical. Of the five studies reporting on antibiotic prescription rates, three showed a decline of 5%–12% up to 3 years after guideline introduction and two found no or negligible effect. In one US study, the initial 9% decline decreased to 5% after 4–6 years. The recommended first choice antibiotic was prescribed more frequently (9%–58% increase) after guideline introduction in four out of five studies reporting on this outcome. Analgesic prescription rates for AOM were reported in one US study and increased from 14% to 24% after guideline introduction. 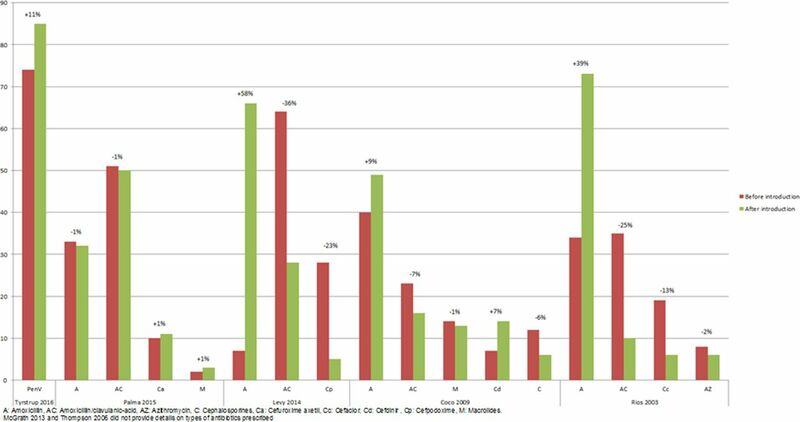 Conclusion Based upon what is published, the effects of introduction of national clinical practice guidelines on antibiotic and analgesic prescribing for children with AOM seem modest at the most. However, the true impact of introducing AOM guidelines on prescription of antibiotics and analgesics for children with AOM in daily practice has not been reviewed systematically. We aim to do so and provide an overview of current available studies that compare prescription data before and after national AOM clinical practice guideline introduction. 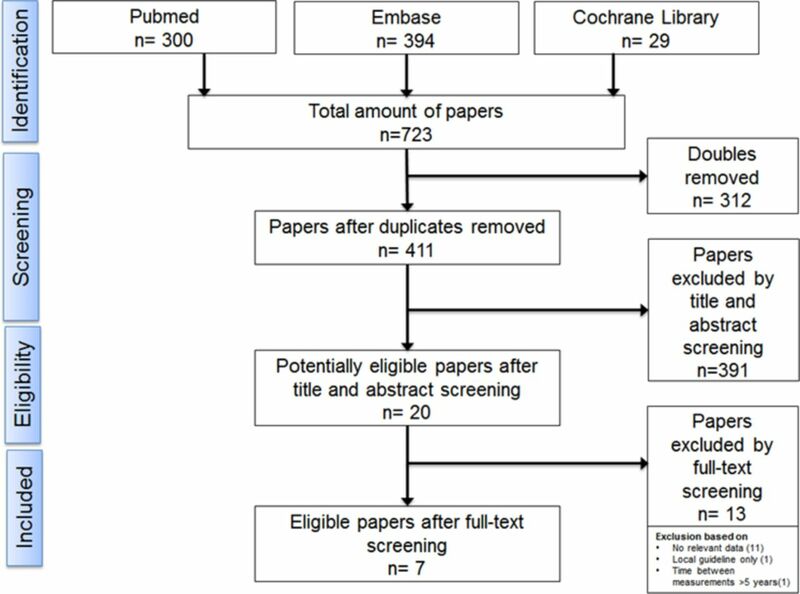 We performed systematic searches of the PubMed, Embase and Cochrane Library databases from inception to 6 June 2017 using database-specific syntaxes of keywords relevant to ‘acute otitis media’ and ‘guidelines’ (see online supplementary for full search strategies). After removing duplicates (RefWorks), two reviewers (YD and RTvU) independently screened titles and abstracts for inclusion. Discussion with a third and fourth reviewer (MLAdH and RPV) resolved any discrepancies. We screened reference lists of included studies for additional studies. We included all original studies, irrespective of design, setting or language, evaluating the effects of the introduction of national clinical practice guidelines on prescription of antibiotics (rate and type) and/or analgesics for children (up to the age of 16 years) with AOM by comparing data before and after guideline introduction. We only included studies in which the time between data collection before and after guideline introduction was less than 5 years; this was to minimise the impact of other factors that may affect AOM epidemiology and subsequent prescription rates, for example, the introduction of pneumococcal conjugate vaccines and anti-smoking campaigns. The primary outcome of interest was the overall antibiotic prescription rate for AOM. Secondary outcomes included type of antibiotic prescribed and analgesic prescription rate. Two review authors (YD and RTvU) independently extracted the following data from the included studies: characteristics of study (year, country, design, setting and data source), study population (number and age of children with AOM), guideline details (date of introduction, method of dissemination and management recommendations) and data on our predefined outcomes. Discussion with a third and fourth reviewer (MLAdH and RPV) resolved any discrepancies. To obtain further information on guideline dissemination strategies, we contacted authors of the original publications as well as clinical scientists involved in guideline development in countries subject to this review. 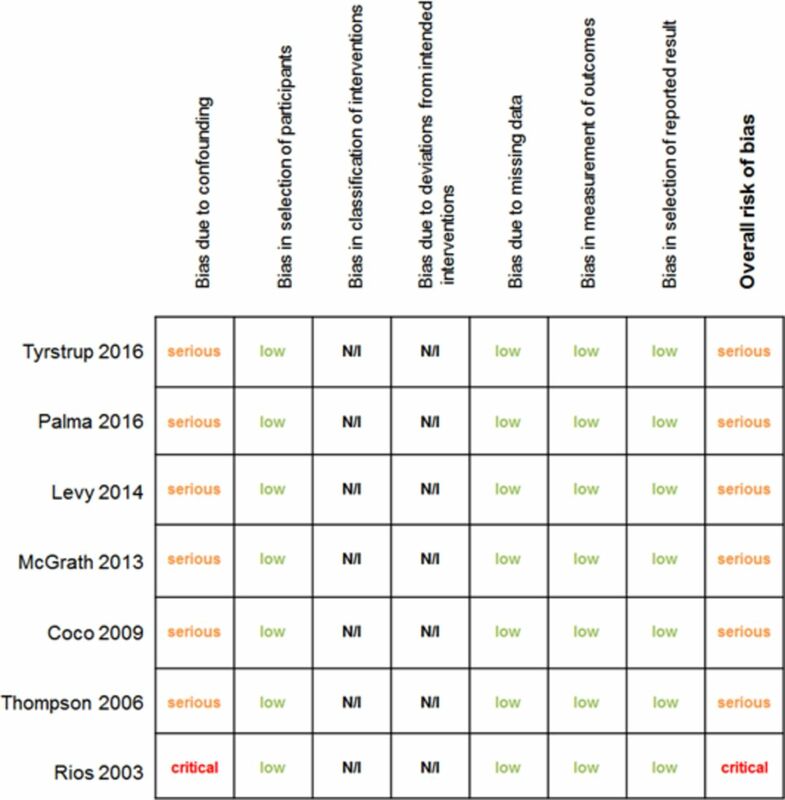 Methodological quality of the included studies was assessed by three reviewers independently (YD, RTvU and RPV) using ‘The Risk Of Bias In Non-randomized Studies of Interventions (ROBINS-I) tool’,7 and any discrepancies were resolved by discussion. Antibiotic prescription rates, type of antibiotic and analgesic prescription rates before and after introduction of the AOM clinical practice guideline were presented for each study individually. Where before and after guideline introduction data were reported for individual years or subgroups, (such as age), we aimed to calculate averages. Figure 1 shows the search results; 20 of the 411 unique records were considered potentially relevant. Of these, seven studies8–14 were suitable for inclusion in this review. For detailed information of the included studies (see table 1); the seven studies were conducted in six countries: France, Italy, Spain, Sweden, UK and USA (two studies). All were observational studies using longitudinal data of children aged under 15 years; they differed substantially in terms of setting (primary vs secondary care), number of patients (n=200–4.6 million), study duration (6 months–10 years longitudinal data) and data source (routine care, insurance databases or electronic surveys). Table 2 summarises the key guideline recommendations of the included studies. Detailed information on guideline dissemination strategies was obtained for Italy, Sweden, UK and USA (table 3). The method of dissemination varied considerably across countries, ranging from passive dissemination through online publication or paper copies targeted at individual physicians only to extensive (public) media attention, interactive workshops and joint antibiotic stewardship campaigns. Risk of bias was judged serious in six studies and critical in one; see figure 2. The primary and secondary outcome data are illustrated in figures 3 and 4. Two of the five studies reporting antibiotic prescription rates before and after guideline introduction showed no or a negligible effect. Three studies showed a decline of 5%–12% up to 3 years after guideline introduction. One US study reported both the short- and long-term impact of guideline introduction; the decline of 9% in the first 3 years decreased to 5% after four to 6 years. In four out of five studies reporting on the type of antibiotic prescribed, prescription of the recommended first choice antibiotic, either amoxicillin or penicillin V, increased by 9%–58% after guideline introduction, with inverse trends for amoxicillin/clavulanic acid which decreased by 7%–36%. Only one US study reported on analgesic prescription rates; this increased from 14% before to 24% after guideline introduction. The introduction of national AOM clinical practice guidelines seems to have at best a modest impact on antibiotic and analgesic prescribing; antibiotic prescription rates decrease by a maximum of 12% and analgesic rates increase by 10%. Its effect on the type of antibiotic is more substantial with an increase of up to 58% for the recommended first choice antibiotic. Our findings should be interpreted with some caution. Despite our efforts to minimise the impact of external factors affecting childhood AOM epidemiology and prescribing patterns, such as anti-smoking campaigns, pneumococcal conjugate vaccination and strategies to promote breast-feeding,20 21 we cannot rule out this has influenced our results. Also, we were not able to account for ongoing prescribing trends prior to the introduction of the guideline; none of the studies applied interrupted time-series analysis.22 Importantly, dissemination of the guideline to the general audience suggesting that parents can manage milder cases of AOM themselves can lead to fewer overall AOM consultations and subsequent antibiotic prescriptions.23 Nevertheless, only two out of the seven studies reported on annual fluctuations in AOM consultation rates and none of them accounted for this in their analyses.13 14 Besides, when parents do self-manage these milder cases of AOM, physicians may be faced with more severe AOM and thus prescribe antibiotics more frequently (leading to a relative increase over time). These aforementioned trends are not captured in the studies. Neither are the phenomena that, with explicit diagnostic guidance, physicians may diagnose AOM more accurately, leading to fewer overall diagnoses and antibiotic prescriptions, but at the same time a higher prescription rate per diagnosis. Finally, the vast majority of analgesics for AOM are obtained over-the-counter rather than prescribed. This implies that our results regarding analgesic prescriptions for AOM are incomplete and preclude strong conclusions. Based on what is published, the introduction of national AOM clinical practice guidelines seems to have at best a modest impact on antibiotics and analgesics prescription rates for childhood AOM. Future studies evaluating the impact of clinical guidelines using longitudinal observational data should use a quasi-experimental approach, and take fluctuations in AOM consultation rates into account, to provide more meaningful estimates on the impact on antibiotic and analgesic prescribing. We are grateful to our colleagues P Little (UK), P Marchisio (Italy), R Rosenfeld (USA) and M Tyrstrup (Sweden) for providing information on guideline dissemination in their respective countries.
. Changing physician performance. 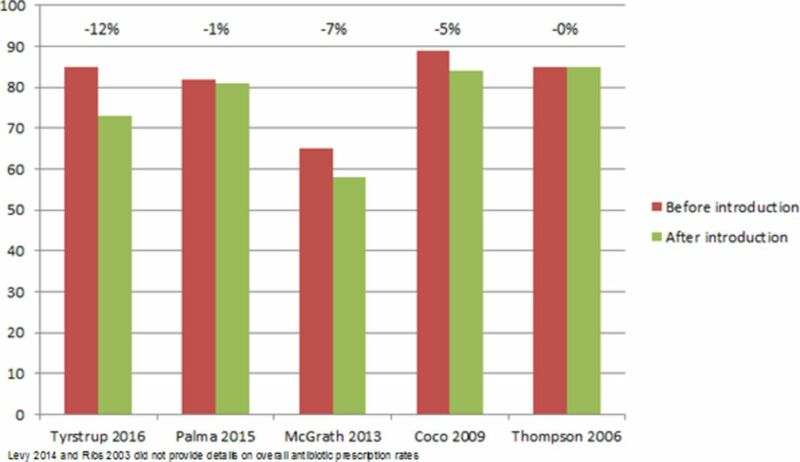 A systematic review of the effect of continuing medical education strategies. JAMA 1995;274:700–5.
. Interrupted time-series analysis: a regression based quasi-experimental approach for when randomisation is not an option. BMJ 2015;350:h2750. YD and RTU contributed equally. Contributors YD, RTvU and RPV collected and reviewed primary data. YD and RTvU drafted the first version of the manuscript. All authors revised the manuscript and accepted the final manuscript for publication. Funding This review was supported by a grant from the Netherlands Organisation for Health Research and Development (ZonMw)—HGOG subprogramme.